A little warning : my network/security knowledge is a bit rusty since I’m a Java programmer and don’t do this stuff on a daily basis. This article is written for Mac (Yosemite) and Firefox (42). But with a but of tuning it should work on other Mac version, Linux and Chrome too. I won’t introduce HTTP/2. There are plenty of good explanations and when you follow all the links at the Sources-section of this article you should have enough information to understand this article. Http/2 should be enabled by default, but when you want to disable it (to show the HTTP/1.1 SSL traffic for example) or have to troubleshoot you might have to change things. Go to about:config in your location bar and search for ‘spdy.enabled’. In my version of Firefox there are 4 settings, which should all be set to true. When you changed a setting you should restart the browser for the settings to become active. Now enable the network inspector in Firefox ( alt-command-Q ) and enter https://twitter.com in the location bar. When you click the first entry (something like ‘200 GET / ‘) you should see HTTP/2.0 at the Version field on the right. This inspector is of course a great way to analyze your traffic, since it’s in the browser you don’t need to worry about ssl decoding. But I wanted more, the raw decoded HTTP/2 packets. And since Hadi Hariri made it sound very easy I gave it a shot. Wireshark can, of course, be used to capture traffic but I used tcpdump. 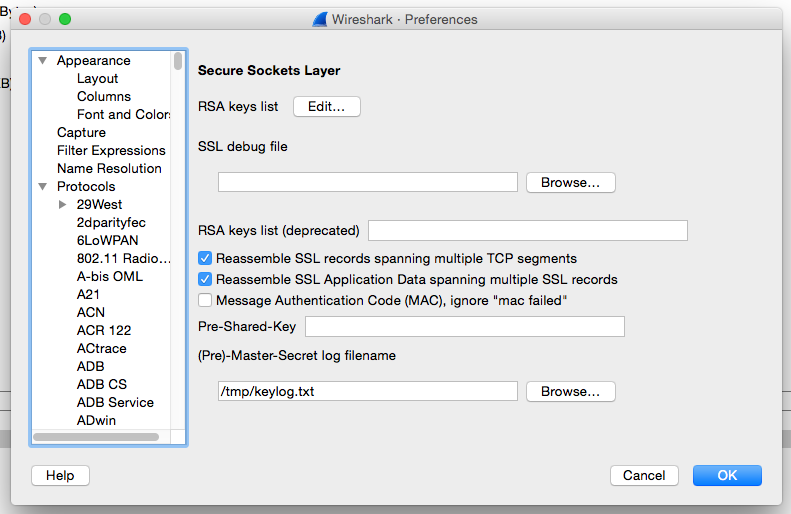 I had some problems with wireshark. A lot of packets were captured, but I couldn’t find the right ones. I think it should be possible with wireshark, but with tcpdump it was a lot easier for me to direct the output to a file and do some pre-filtering on port 443 (the SSL port). My starting point was the article ‘Debugging HTTPS or SSL Connections to a Third Party‘ . In theory this method should work for both HTTP/2 and HTTP/1.1, but I think I found an easier method for my purpose. Make sure the INTERFACE variable is right (run ifconfig and look voor the various devices). If your on both a wire and wifi disable one of them since you’re never sure which device is getting the packets. lo0 can be used for local traffic. When you’re done close your browser. I’m not exactly sure if this is needed, but it gave me more consistent results. There should be a file at /tmp/keylog.txt and /tmp/tcpdump.out. With these two files you can anlyze the traffic. Now fire up Wireshark (as of version 2.0.0 XQuartz is gone! So make sure you update Wireshark if you already had it installed). When you click on a packet with HEADERS in the info you will be able to view the HTTP/2 headers. Note that if you don’t see all traffic this might be due to the fact that a lot of traffic is QUIC-traffic, to see all HTTP/2 traffic you should disable QUIC. In Google Chrome this can be done at chrome://flags and search for QUIC.